Every now and then Harley-Davidson makes motorcycles that tug at the heart strings of bikers who aren't exactly 'into' cruisers. I've certainly enjoyed my time in the saddle of every possible Harley across segments, but one of my personal favourite till date is the XR1200X. The bike had a bit of a wild streak, not to mention its nimble handling as compared to most of its siblings. And I found the Street 750 to be possessing a similar streak, with its quick revving motor, nimble handling and customisability. Co-incidence then that the new Street Rod is based on the Street 750 and is a spiritual successor to the XR? At first glance, it seems to have the same youthful exuberance and is positioned as an urban machine for the modern biker. The little Rod doesn't promise cruising virtues. Instead, it seems to have what it takes to spice up your daily rides. Harley-Davidson has sold 35,000 Street 750s globally, and is confident that the Street Rod will up the game for it. Swinging a leg over was the best way to find out. The Harley-Davidson Street Rod is based on the Street 750, but H-D says changes are extensive enough for it to warrant an all-new tag. Visual changes include a new headlamp design with a colour-coded flyscreen. The fuel tank is the same but it gets decals which add to its appeal immensely. However, the tank is now positioned further ahead to seat the rider further forward as the rider now has to reach forward to the flat, drag-style handlebar. The bar-end mirrors are an absolute treat, to see and to use. To go with the sportier, slightly canted forward seating position, the Rod uses mid-set footpegs unlike the Street's forward set ones. The rider’s seat is prominently dished out and promises to keep the rider from sliding back on opening the gas. The pillion seat is more generous too. The rear is inspired from streetfighters of the past, when bikers used to chop the bodywork at the rear. In effect, the Street Rod’s rear end looks a lot better than that of the Street, and gets a stylish looking number plate hanger and LED tail lights. Rear shock absorbers are gas-charged and get red-coloured springs. Simply delicious! Those who've had the sole of their shoes melt onto the Street 750's exhaust will certainly appreciate the addition of a heel-guard behind the exhaust side, right foot peg. The Street 750’s conventional forks have been replaced with 43mm upside down forks, while the rake is sharper at 27 degrees, down by 5 degrees. Seat height has been raised to 765mm from the Street 750’s 720mm, but this will barely affect even shorter riders. Mid-set footpegs offer a sporty feel as well, but the overall sense is of a bit of awkwardness. The pegs are set a bit wide and high, as a result of which my knees were pointing outward and thighs were as high as the tank. Another issue is that just like the Street 750, your left thigh is still precariously close to the rear cylinder, and when you keep your right foot down each time you halt, you can feel the heat which can get really bothersome at traffic lights. A bit. Our ride in Singapore was at stipulated speeds, given the country’s knack to crack down upon traffic defaulters. We couldn’t ride the Street Rod hard and hence, it is difficult to give a definitive answer, but it does have a quicker feel. The engine, in this guise, called the High Output Revolution X, gets extensive changes too. Most importantly, it now gets new pistons which have bumped compression up to 12.0:1, along with revised intake ports and higher-lift cams to improve the power output. And power output is a number Harley-Davidson never reveals! Peak torque though is up to 65Nm from 59Nm, which has given initial grunt a little boost, while also improving in-gear acceleration. Effectively, there is an 8 per cent increase in the torque spread, and responses at low speeds were certainly quicker than the Street 750. The air intake box is designed to resemble a supercharger and also contributes to the slightly sportier sound, though the intake sound isn’t anywhere close to that of the XR in terms of sportiness. The bike also gets 42mm dual-throttle bodies, while the exhaust is shorter and has been revised as well. 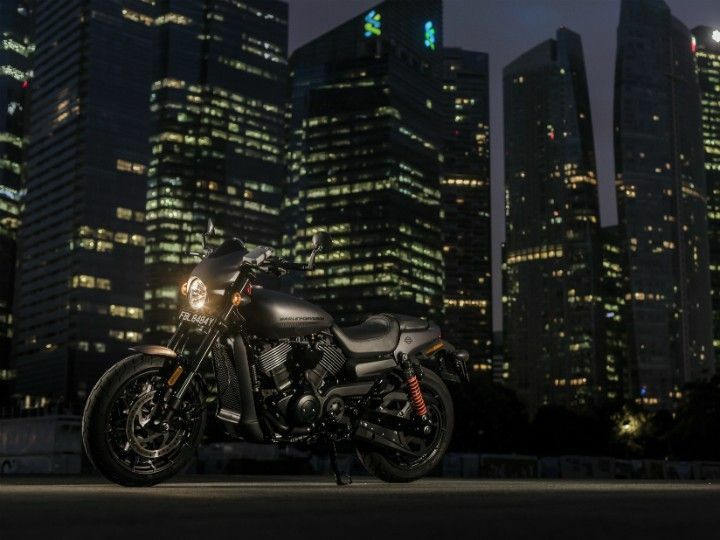 Singapore was chosen as the venue for our test ride, given the Street Rod’s positioning as an urban motorcycle, and the tiny country’s near-perfect roads. Needless to say, the roads were far better than ours, though not among the smoothest. It was easy to feel the increased stiffness of the suspension, particularly the front, though I wouldn’t call the setup stiff. It feels firm, but doesn’t really compromise ride quality. The extensive changes to the chassis and the firmer suspension have made the Street Rod a motorcycle that’s sharper to ride through traffic, quicker to turn in into corners and lighter on its feet. The engine’s improved low-end and mid-range grunt compliment these changes well, and give the Street Rod a livelier feel. This makes the Street Rod more likeable as a motorcycle you could ride to work every day or for a casual late night ride across town and the well spaced ratios on the six-speed transmission suit the usage too. Refinement was always one of the highlights of the Revolution X engine, and the good news is that the engine feels as smooth and refined as before. There was nary a moment when I didn’t feel confident of squeezing the bike through two cars or had to back off around corners and roundabouts. Given its peculiar handlebar-seat-footpeg combination, the Street Rod isn’t a motorcycle you would want to go touring on. The flat bars need you to reach out to them a bit, which along with the taller seating felt more apt for hard riding over short distances rather than spending long hours in the saddle. The improved lean angles are welcome, and not once did I ground the footpegs over the entire course of our ride. If you were disappointed by the Street 750’s brakes, the Street Rod’s brakes will please you as the difference is immense. Some more feedback from the lever would have been nice, but the Street Rod’s brakes offered good bite, making for quicker, surer stops. Of course, ABS is standard, which is welcome. In a nutshell, sure! The Street Rod has a lot more character than the Street 750; not just visually, but in terms of the riding experience too. Harley-Davidson is clear about the distinction between the two, and says that while the Street is for fairly inexperienced riders, the Street Rod is a motorcycle for more experienced riders who want a smaller motorcycle for riding around town. It looks a whole lot sportier, offers better performance and handles a lot better too. Harley-Davidson says it has worked extensively on improving quality levels and fit-finish levels, and our test bike’s quality echeoed that promise. That said, quality of switchgear isn’t very different from the Street, and could have been better, though the messy wiring is gone and wiring looks a lot cleaner. At its price of Rs 5.86 lakh ex-showroom New Delhi, the Street Rod commands a premium of almost a lakh rupees when compared to the Street 750 which retails for Rs 4.98 lakh. Given the overall improvements and enhancements, the premium is justified, though only a full road test in Indian conditions will help us assess the motorcycle better. But, for now we can say that while the 750 might be the sensible all-rounder, the Rod has taken up the mantle of the thrill-seeking back-alley brawler of the Street family.